We have Ink Products to fill any need. This series of ink is formulated with a highly developed vehicle system that will sta-open indefinitely, but will dry on both coated and uncoated substrates. This series is suited for in-line coating application, is laser safe, will accept foil stamping and most U.V. This set of inks is primarily formulated for offset, matte and board stock where more rub resistance is required and the use of overcoats is not applied. It has been formulated with select vehicles and waxes to assure good rub resistance with a fast set time. Driers are formulated into the system, however, ink will sta-open on press for 2-4 hours. The All-American system is our latest series. This unique product gives you fast drying and excellent rub resistance. Formulated with state of the art vehicles and waxes, this set of ink will allow for in-line varnish & coating, but is not recommended for offline applications. With a sta-open time of 8-12 hours, this is an excellent, all-purpose set of ink for today's pressroom. Using the finest ingredients available, this system dries fast on coated and uncoated substrates and still has a sta-open time of more than 24 hours. This allows the pressroom time for long periods of press shutdown due to shift changes or customer delays. This system will allow for in-line and off-line applications and is laser safe. This set of inks is made for non-porous stock applications and as such dries by oxidation only. Formulations exist for lightfast and non-lightfast versions. It is recommended for use on foil, styrene, static cling, and similar substrates. We recommend that testing be done before printing to assure that proper adhesion will be achieved. This set of inks is made with a fast-setting vehicle system. Driers have been added to insure good drying on paper substrates. It is a wax free system formulated with pigments that are lightfast. This allows for U.V. coating applications. This set is available in 4/C process and pms colors. Shades on the pms colors may vary from the book due to necessary pigment selections. This set of inks is formulated for use on small offset presses. This series will sta-open, but will dry quickly on paper substrates. These inks have a heavy, free flowing body and are meant to be run on presses with integrated dampening systems. This set is also available with driers added if desired. This set incorporates the latest vehicle technology for waterless ink types. It insures the printer excellent press stability while achieving good gloss, rub, fast set and dry times. This set is available in 4/C process, mixing and all spot colors upon request. Forms Inks are designed for High Speed Web No Heat Offset Presses. Available in 4/C, Mixing and Custom colors. These inks have good rub resistance and set-up quickly on absorbent offset stocks. This set allows for quick post print folding and cutting applications and has excellent press stability. Soyform Inks are designed for High Speed Web No Heat Offset presses. Available in 4/C, Mixing and Custom colors. Inks have good rub resistance and set-up quickly on absorbent offset stocks. This set allows for quick post print folding and cutting applications. This series of inks has excellent press stability. This series is formulated with a special blend of laser resistant vehicles for added heat resistance that is required for laser applications. 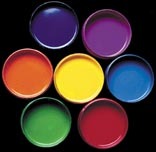 These inks are readily available in 4/C process, Mixing and Custom colors. This is our highest quality Heat Set Web Offset Ink. This product line has high color strength, good gloss, good rub and scratch resistance along with excellent transfer and press stability. It is intended for higher quality printed pieces. It can run on expensive cover sheets, down to better grades of Offset Uncoated Stock. Inks are available in 4/C process, mixing colors and custom colors. Formulated with squalene resistant vehicles and flushes, along with extra wax and driers, this set of inks is what you need for the cover. Available in 4/C process, mixing and custom made spot colors. This set of inks has good gloss and rub resistance and has excellent transfer and press stability. These inks give the printer good gloss, good rub and scuff resistance on offset and coated substrates. Excellent for low basis weight offset, groundwood and supercal enamels. This ink is an economical workhorse for the pressroom.